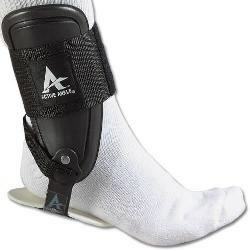 Volleyball Ankle Braces - What Is the Best Volleyball Ankle Support for You? If you’re considering using volleyball ankle braces for preventative care or recovery reasons, there are a few basic things you should know about the differences as well as some of the shared benefits. For those who don’t know, ankle braces aren’t necessarily reserved for those who are recovering from an injury - they can also be used by those looking to improve stability and prevent injuries before they happen. No one plans on an injury, but wearing an ankle brace might be one of the few things that decrease the likelihood of its occurrence in the first place. A serious injury can leave you out of the game for weeks or months, which is why a lot of coaches recommend braces to players who aren’t injured. Examples of the "Sock Model"
These volleyball ankle braces are simple and effective supports that slide on just like a sock. They are typically made of tough, durable, non-stretch fabric and have a lace-up, one-size-fits-all design that keeps your foot secure while you play. The sock model is usually the most popular type of ankle brace because of sheer simplicity and effectiveness. The only downside is the fabric design, which is not quite as durable as a mechanical brace (below), so you might notice more wear and tear if you use it over a long period of time. The sock model could be a better fit for an athlete who is recovering from the injury and needs extra support for a loose ankle. The mechanical model presented below is better for injury prevention and doesn’t support the loose ankle as effectively. 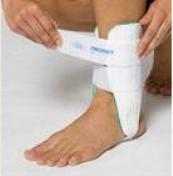 This volleyball ankle support is a bit more complex but utilizes more durable materials than the sock model. 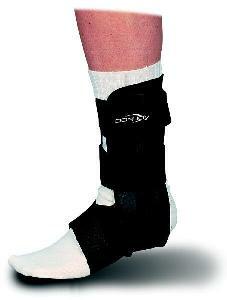 A mechanical brace is a strap-on support that wraps around the ankle with padding and secures itself to the base of the foot with a stirrup. 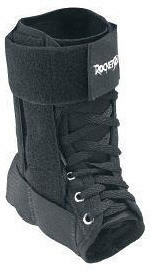 This is a very durable design and allows for a secure mobility with the ankle. The main downside of the mechanical brace is the plastic parts aren’t as comfortable when pressed against the foot, so this may not be the ideal model for some. Many volleyball athletes prefer the mechanical model over the sock model for injury prevention, since sock models could be too supportive and may lead to weakened ankles and sprains when the ankle support is not worn. 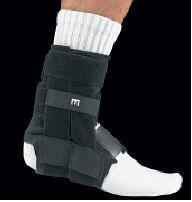 Any brace you choose for injury prevention, it is recommended not to wear it all the times. For example, you could do your conditioning training without braces and wear them only during volleyball practice and matches, where the most volleyball ankle injuries occur. Some volleyball ankle supports are packed with aircells, gel or other soft material, particularly geared toward healing the ankle. This particular brace here on the left features two shells lined with an overlapping aircells that provide graduated compression and protection during ambulation. The soft cells provide support and compression when stepping with the injured ankle, while enhancing circulation and reducing swelling. The inflated air pockets add comfort value without sacrificing stability. Most people who use this option report a dramatic decrease in swelling and discomfort, which helps normalize critical movements more quickly during injury recovery. This makes it ideal for anyone recovering from a recent ankle injury.